Crews on Wednesday morning rescued a woman off a Daly City cliff – an effort that was made more difficult because her two pit bulls chased away emergency responders who came to help. Just before 7 a.m., a red U.S. Coast Guard helicopter lowered an emergency responder down a sandy cliff at Thorton State Beach, who then hoisted up the woman, and possibly one of her dogs, to safety. 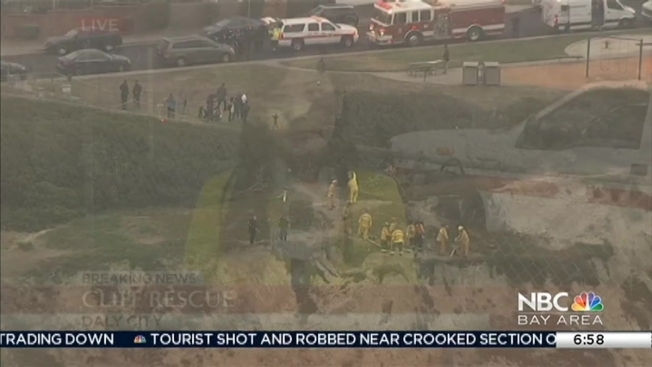 The NBC Bay Area chopper hovered above, capturing the dramatic rescue on video. Both dogs were seen on the beach shortly afterward. The happy ending followed at 1:15 a.m. distress call from a 54-year-old woman and a 27-year-old man who sent word for help after they were hiking and fell off a cliff above Thornton State Beach near Palisades Drives – where one person was killed and two others were injured about the same time last year. North County Fire Authority Battalion Chief Tony Maffei said his unit responded as soon as they got the call, but their efforts were hampered as the two pit bulls with the couple posed a threat as they had chased off crews during their first rescue attempts. Video from the scene showed firefighters poised at the ready with a stretcher ready to go down to help. A Coast Guard helicopter circled the sky. Animal control officers stood by. The woman’s companion was able to walk up to safety and was taken to the hospital with some injures. "He seems like he's pretty banged up," Maffei said. On Aug. 30, 2014, Sean Carrington, 29, of Santa Rosa and two others fell about 300 feet off the cliff in the same beach area. Carrington was pronounced dead at the scene. #UPDATE: @uscg returning with diff pilot to make rescue in 30 mins. Will be daylight by then for cliff rescue. Woman stranded is 54, man who was with her is 27. He was able to climb up to house and call for help. At Seton Medical.